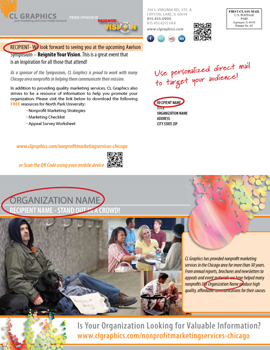 Here is an example of a postcard where we personalized the name and organization throughout the piece. For many non-profit organizations, Print is still a main means of communication with clients, donors, sponsors and prospects. It provides a strong and lasting way to share your message – it provides information and prompts the reader to take action, either by directing to your website or through direct response materials. It is easily distributed to either a wide audience or targeted to specific recipients. CL Graphics can assist you with the design, print production and mail distribution for any of the above materials, or work with either your in-house staff or outside designers to manage the print production only. Our helpful and responsive staff is well versed in the needs of non-profit organizations and understands the time sensitive nature of your projects. We can offer suggestions on how best to prepare your layout, create samples and provide paper options to help enhance the end product. Call on us to talk through your next print project!